The title page of Nidal Hasan's PowerPoint demonstration for a medical lecture in June 2007, indicates how little interest he took in medicine and how much in the perceived contradiction between being a Muslim and an American soldier. As the Pentagon and Senate launch what one analyst dubs "dueling Fort Hood investigations," will they confront the hard truth of the Islamic angle? Despite encouraging references to "violent Islamists" by Sen. Joseph Lieberman (Independent of Connecticut), chairman of the Homeland Security Committee, there is reason to worry about a whitewash of the massacre that took place on Nov. 5; that is just so much easier than facing the implications of a hostile ideology nearly exclusive to Muslims. Indeed, initial responses from the U.S. Army, law enforcement, politicians, and journalists broadly agreed that Maj. Nidal Hasan's murderous rampage had nothing to do with Islam. Barack Obama declared "We cannot fully know what leads a man to do such a thing" and Evan Thomas of Newsweek dismissed Hasan as "a nut case." He delivered an hour-long formal medical presentation to his supervisors and some 25 mental health staff members in June 2007, the culminating exercise of his residency program at Walter Reed. 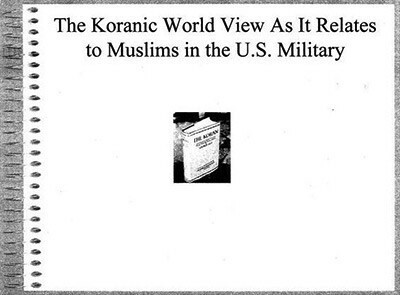 What was supposed to be on a medical topic of his choosing instead turned into a 50-slide PowerPoint talk on "The Koranic World View As It Relates to Muslims in the U.S. Military" that offered such commentary as "It's getting harder and harder for Muslims in the service to morally justify being in a military that seems constantly engaged against fellow Muslims" and the "Department of Defense should allow Muslims [sic] Soldiers the option of being released as 'Conscientious objectors' to increase troop morale and decrease adverse events." One person present at the presentation recalls how, by the time of its conclusion, "The senior doctors looked really upset." Hasan informed at least one patient at Walter Reed that "Islam can save your soul." So apparent were Hasan's Islamist proclivities, reports National Public Radio, that key psychiatry authorities at Walter Reed met to discuss if he was psychotic. One official told colleagues of his worries "that if Hasan deployed to Iraq or Afghanistan, he might leak secret military information to Islamic extremists. Another official reportedly wondered aloud to colleagues whether Hasan might be capable of committing fratricide," recalling Sergeant Hasan Akbar's 2003 rampage. His supervisor, Captain Naomi Surman, recalled his telling her that as an infidel she who would be "ripped to shreds" and "burn in hell." Another person reports his declaring that infidels should be beheaded and have boiling oil poured down their throats. In his psychiatric counseling sessions with soldiers returned from Iraq and Afghanistan, Hasan heard information he considered tantamount to war crimes. As late as Nov. 2, three days before his murderous spree, he tried to convince at least two of his superior officers, Surman and Colonel Anthony Febbo, about the need legally to prosecute the soldiers. Hasan routinely signed his e-mails with "Praise Be to Allah." He listed his first name as Abduwalli, rather than Nidal, in the e-mail address in his official Army personnel record. 'Abd al-Wali is an Arabic name meaning "Slave of the Patron," where Patron is one of God's 99 names. It is not clear why Hasan did this, but Abduwalli could have been a nom de guerre, this being a common practice among Palestinians (Yasir Arafat even had two of them - Yasir Arafat and Abu Ammar). He designed green and white personal business cards that made no mention of his military affiliation. Instead, they included his name, then "Behavior Heatlh [sic] Mental Health and Life Skills," a Maryland mobile phone number, an AOL e-mail address, and "SoA (SWT)." SoA is the jihadi abbreviation for Soldier of Allah and SWT stands for Subhanahu wa-Ta'ala, or "Glory to Him, the Exalted." He contacted jihadi web sites via multiple e-mail addresses and screen names. He traded 18 e-mails between Dec. 2008 and June 2009 with Anwar al-Awlaki, Al-Qaeda recruiter, inspiration for at least two other North American terror plots, and fugitive from U.S. justice. Awlaki had been Hasan's spiritual leader at two mosques, Masjid Al-Ribat Al-Islami in San Diego and the Dar al-Hijrah Islamic Center outside Washington, D.C., and he acknowledges becoming Hasan's confidant. Awlaki speculates that he may have influenced Hasan's evolution and praises Hasan for the massacre, calling him a "hero" who "did the right thing" by killing U.S. soldiers before they could attack Muslims in Iraq and Afghanistan. In those e-mails, Hasan asked Awlaki when jihad is appropriate and about killing innocents in a suicide attack. "I can't wait to join you" in the afterlife for discussions over non-alcoholic wine, Hasan wrote him. One Yemeni analyst calls Hasan "almost a member of Al-Qaeda." 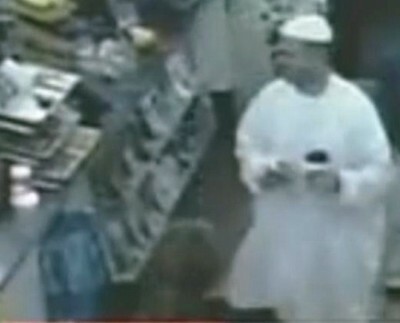 On the day of his rampage, Hasan wore Pakistani-style clothing to a convenience store, where he was photographed on a CCTV. "My strength is my financial capabilities," Hasan boasted to Awlaki, and he donated $20,000 to $30,000 a year to Islamic "charities" outside the United States, some of it going to Pakistan. That Hasan, of Palestinian extraction, wore Pakistani clothing on the morning of his rampage points to his jihadi mentality. He had "more unexplained connections to people being tracked by the FBI," other than Awlaki, including some in Europe. One official characterized these as "Islamic extremists if not necessarily al Qaeda." Duane Reasoner Jr., the 18-year-old Muslim convert whom Hasan mentored in Islam, calls himself a "extremist, fundamentalist, mujhadeen, Muslim" who outspokenly supports Awlaki, Osama Bin Laden, the Taliban, Omar Abdur Rahman (the blind sheikh) and Adam Gadahn (Al-Qaeda's top American figure). These symptoms in the aggregate leave little doubt about Hasan's jihadi mentality. But will the investigations allow themselves to see his motivation? Doing so means changing it from a war on "overseas contingency operations" and "man-caused disasters" to a war on radical Islam. Are Americans ready for that? Nov. 21, 2009 update: For further information on this subject as it becomes available, see my weblog entry, "More on Maj. Hasan's Islamist Life."